The need for additional software assurance testing has again delayed the launch of SpaceX's commercial demonstration flight to the International Space Station, the company announced Friday, until at least May 19. "SpaceX and NASA are nearing completion of the software assurance process, and SpaceX is submitting a request to the Cape Canaveral Air Force Station for a May 19 launch target with a backup on May 22," the company said in a statement released Friday. "Thus far, no issues have been uncovered during this process, but with a mission of this complexity we want to be extremely diligent," the statement said. Launch of the Falcon 9 rocket on May 19 would occur at approximately 4:55 a.m. EDT (0855 GMT). The mission can only launch every few days to ensure the Dragon spacecraft has sufficient propellant margins for extra orbital maneuvers planned for the test flight. The launch slip puts liftoff of the test flight from Cape Canaveral after the docking of a Russian Soyuz spacecraft with three new space station residents - a NASA astronaut and two Russian cosmonauts - to restore the lab to a full six-person crew. NASA and station partners avoid having two visiting spacecraft fly to the space station at the same time. The Soyuz is due to launch May 14, U.S. time, and dock with the space station May 17. SpaceX has blamed delays from the beginning of this year on the need to verify flight software can safely accomplish the Dragon spacecraft's final approach to the space station, a sensitive phase of the mission in which the capsule must be capable of recognizing on-board problems and executing an abort out of the vicinity of the crewed outpost. "After additional reviews and discussions between the SpaceX and NASA teams, we are in a position to proceed toward this important launch," said Bill Gerstenmaier, NASA's associate administrator for human exploration and operations. "The teamwork provided by these teams is phenomenal. There are a few remaining open items but we are ready to support SpaceX for its new launch date of May 19." The last target launch date for the test flight was May 7. SpaceX completed hardware-in-the-loop testing last week to simulate how the Dragon spacecraft systems and software will work together in space, but changes to the software compelled NASA to rerun another set of integrated software testing, according to a source familiar with the flight. The software is responsible for the final steps of Dragon's rendezvous with the space station. Engineers and managers are still checking the results of the tests before approving the flight to proceed to the space station. The Dragon spacecraft is loaded with cargo and maneuvering fuel inside SpaceX's hangar at Complex 40 at Cape Canaveral. 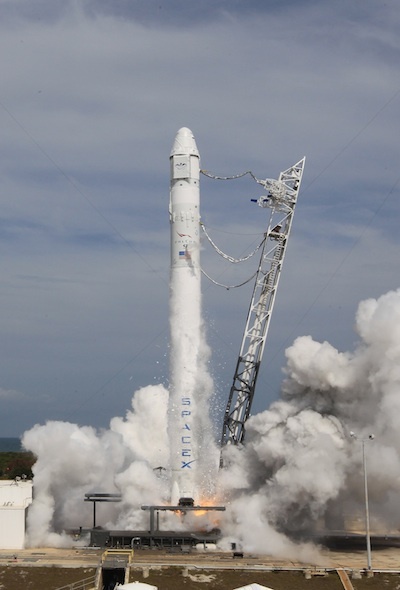 Its Falcon 9 launcher completed an on-pad test firing Monday of its nine Merlin main engines. The capsule's pressurized cabin contains 1,146 pounds of cargo to be sent to the space station, including food, clothing, laptops, and experiment hardware. If the Dragon blasts off May 19, it will reach the International Space Station on May 21 for a flyby 1.6 miles below the complex. The test approach will check the craft's guidance, navigation and control systems before NASA allows the vehicle to come closer to the space station. If all goes according to plan, the Dragon will be in position to rendezvous with the space station again May 22 for berthing with the orbiting lab. But the mission's primary goal is to demonstrate Dragon's ability to autonomously and safely rendezvous with the complex. 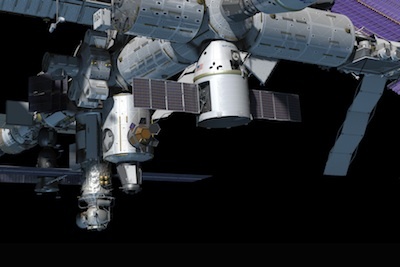 SpaceX developed the Dragon spacecraft with private capital and NASA funding to resupply the space station on at least 12 operational robotic cargo missions. SpaceX will receive $396 million from NASA for development and testing of the commercial cargo system, and the bulk of the money has already been awarded to SpaceX. If the upcoming flight goes as planned, another Dragon capsule will launch later this year on the first of the dozen resupply flights. SpaceX signed a $1.6 billion contract for the operational missions in 2008.